A major change this year in how online advertisements are sold has been embraced by hackers, who are using advanced ad-targeting capabilities to precisely deliver malware. Security vendor Invincea said it has detected many instances of people within defense and aerospace companies stumbling across malicious advertisements that are shown only to them, a scheme it calls "Operation DeathClick." A white paper on the scheme will be released Friday. The cybercriminals are taking advantage of a sea change in the online advertising industry, which has mostly stopped selling "bulk" user impressions and moved to real-time bidding for advertisements that are highly targeted, said Patrick Belcher, director of malware analysis at Invincea, in a webinar presentation Thursday. Web advertisements are sold to the highest bidder on online exchanges by buyers who can specify who the ad is shown to by IP address range, region, industry vertical or even just by specific corporations. That has proved advantageous for cybercriminals, who are signing with ad brokers to participate in real-time ad bidding. They have to win a bid for the right to show an ad, but the cost can be as little as US$0.65, Belcher said. When the bid is won, ads are supplied that redirect visitors to landing pages on legitimate websites that have been hacked. Those landing pages then automatically try to install malware on the victim's computer, he said. Invincea has detected malicious ads on websites such as the fantasy football site fleaflicker.com, earthlink.com and the conservative commentary site theblaze.com. The landing pages those ads redirect to are up for as short as 10 minutes to four hours. "Those landing pages are stood up and torn down so quickly that nobody in the security industry are able to detect the malicious URL and put it on a blacklist fast enough," Belcher said. "By the time it is, the page is gone." The malware is modified so frequently that it is hard for security products to detect, he said. In one example, a person who worked for a defense contractor browsed to the Shootersforum.com, a website for gun enthusiasts. 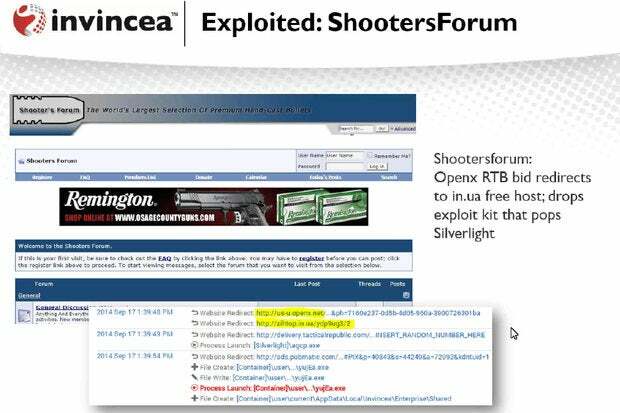 A bogus ad for a gun dealer in Missouri was shown by the exchange OpenX, which automatically redirected to a free hosting site that had an exploit kit. That kit tried to exploit a vulnerability in Microsoft's Silverlight multimedia program and likely then tries to install a backdoor, which is a program that allows for persistent access to a compromised machine, Belcher said. Part of the problem comes from advertising companies allowing advertisers to host their own ad content so those companies can gather their own metrics on the ads, Belcher said. But the ad companies allow those advertisements to automatically redirect visitors elsewhere when viewed, which is relied on by cybercriminals to make their attacks work, he said.